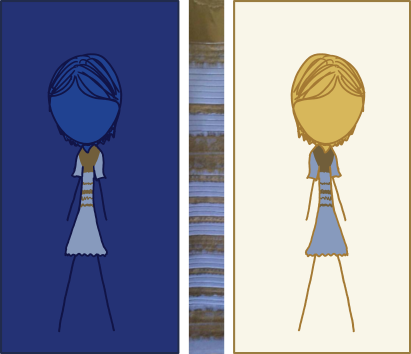 After writing a Special Edition of the Color Explorer News, I spent the better part of this week following The Dress. Who would have guessed that the color of a dress could become such an internet sensation! Randall Munroe of xkcd fame drew the explanation above. If you’ve not already seen it a million times, the dress in question is the one shown in the middle of the photo below. 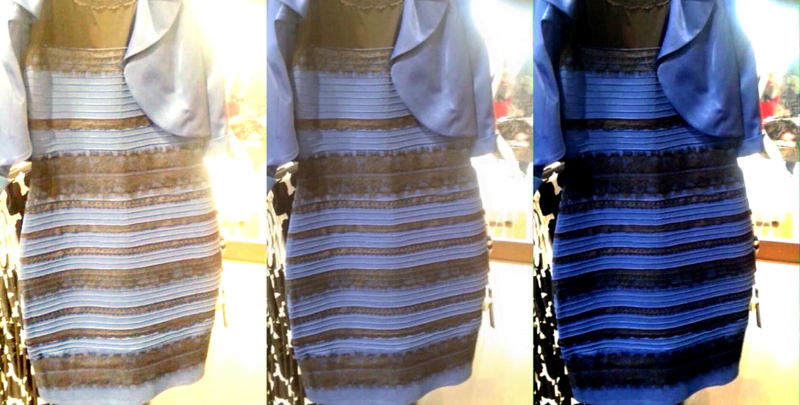 The debate over the color of The Dress generated over three million votes on Buzz Feed. That’s a big enough number to make neuroscientists sit up and take notice. After reading all the various scientific explanations, here’s my interpretation of what happened. Last April, I gave a seminar at the IPCA conference in Malta about color and optical effects. 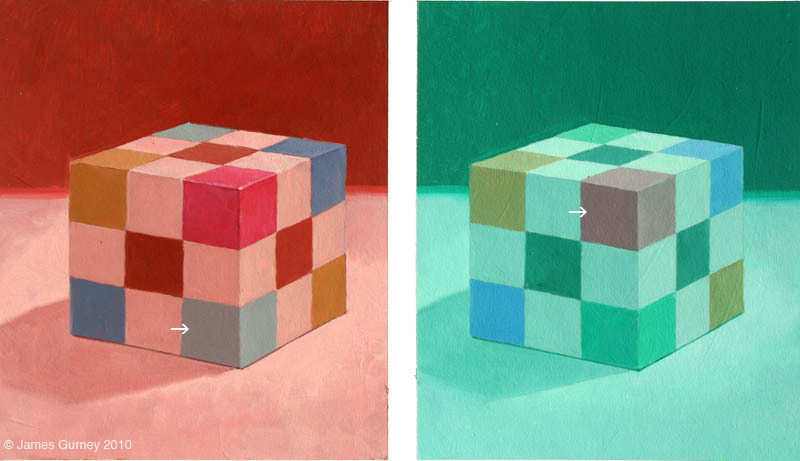 I included examples of color constancy similar to the cubes below by artist and author James Gurney. The blue square in the red picture is the same color as the red square in the green picture. From James Gurney. Forget about the color of the dress, it’s all about the perceived color and quality of the lighting. The main reason people see the dress differently is based on Color Constancy. The illustration above shows that we make decisions about color based on the clues we get about the color of the illumination. The original Dress photo caused an internet frenzy because the clues about the lighting were ambiguous. With no solid cues available, our brains shifted into personal default mode to make a split second decision about the lighting. What the results of The Dress survey showed was that there were at least two very different default positions possible. Flip the switch one way and you see a blue and black dress, flip it the other way and you see a white and gold dress. The image above is from an interview of Jessica Witt, associate professor of psychology at CSU. The left side shows the default switched to assume a dress washed out in the glare of light. The right side shows the default switched to assume the dress is in shadow. Believe it or not, the right side of both dresses are the same colors. Since my husband saw it as white and gold, and I saw it as blue and black does that mean we are “wired” differently? (Well, we are but we already know that!) If his default is to see it in shadow does that mean he’s a glass half empty kind of guy? No, he’s not. The real news is that the dress is just the tip of the neuroscience iceberg. The BIG, HUGE question is – how does the brain decide each person’s specific default position? The theories proposed over the past week are all over the map. They range from variations in the number of cones in the eyes and gender bias, to age bias, to preferences for warm or cool colors, to prior experiences, to time spent outdoors while growing up, to whether you are a morning or night person or a right brained or left brained person. Yikes! I bet it will take the scientists years to figure it all out. Count them and then fill out the survey below . . .
Just for fun, I’m collecting my own data. Count the colors you see in the Derval Color Test above and then scroll down and fill out the survey below. I will share the results in a future post.